The HYDAC RKM filter series is return line and suction boost filter for a combination of hydraulic circuits. It has a flow capacity up to 850 l/min and a pressure capacity up to 10 bar. RKM return line & suction boost filters are ideals for use in equipment with two or more circuits. Indeed, this filter is the “first choice” for mobile machinery using hydrostatic drives (e.g. wheel loaders, forklift trucks, harvesting machines). Especially if the return flow is greater than the requirement for flow on the suction side under operating conditions. To begin with, return flow’s supply of the operating hydraulics to the filter happens via one or several inlets “A”. And its cleaning happens via the filter element (full flow return line filtration). There is an application of a pressure of 0.5 bar (standard) inside the element by the back-pressure valve “V1”. This ensures that the filtered return line flow is available to the hydrostatic feed pumps connected in “B” ports. This is what we call a full flow suction boost filtration. Therefore, there is a significant reduction of the risk of cavitation. Then, happens the drainage of the excess flow to the tank via port “T”. The fitting of a bypass valve “V2” (standard = 2.5 bar) allows relieving excessive back pressures in the element. This step is important on cold starts when the viscosity is high. 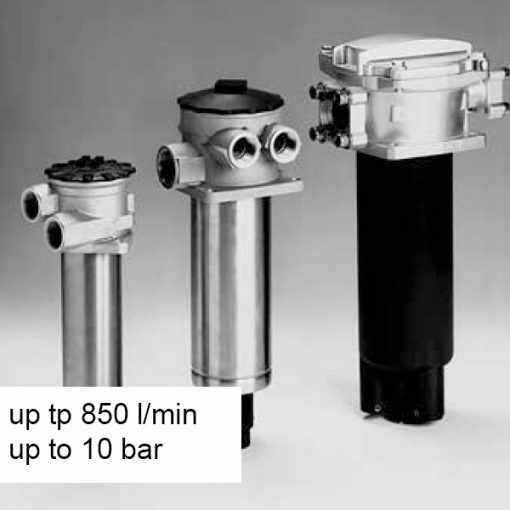 Therefore, this ensures that only oil with fine filtration is available to the suction port during operation (exception: RKM 350). Moreover, with optional valve “V3”, it is possible to draw oil from the tank for short periods. E.g. initial filling, venting after changing element.